Whether you're hosting a dinner party or simply cooking meals for the family the SousVide Supreme water oven really is the bees knees of kitchen equipment. Here I've made three different starter courses, all inexpensive and simple to make but there's a difference to the norm, the chicken, peppers, egg and asparagus used in these dishes were cooked in a SousVide Supreme Water Oven. Meaning you can cook ahead and without fuss, get on with your day and dinner is ready when you are. Just recently I was lucky enough to be sent an absolutely fantastic piece of kitchen equipment in the form of a SousVide Supreme Water Bath. 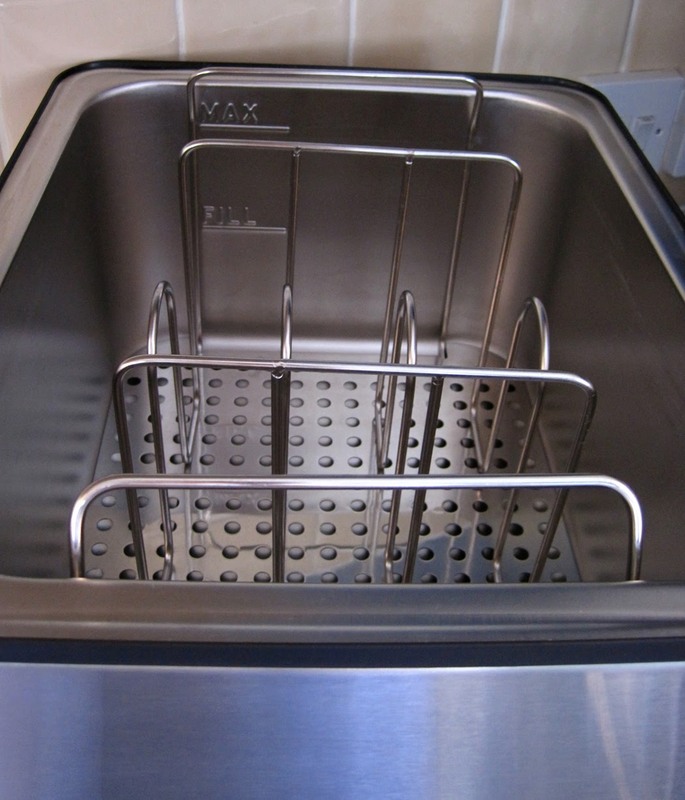 After seeing the water bath method of cooking programs such as Masterchef, you've no idea how much I've wanted one since. That said, the ones in professional kitchens are far too big to fit in my tiny kitchen. 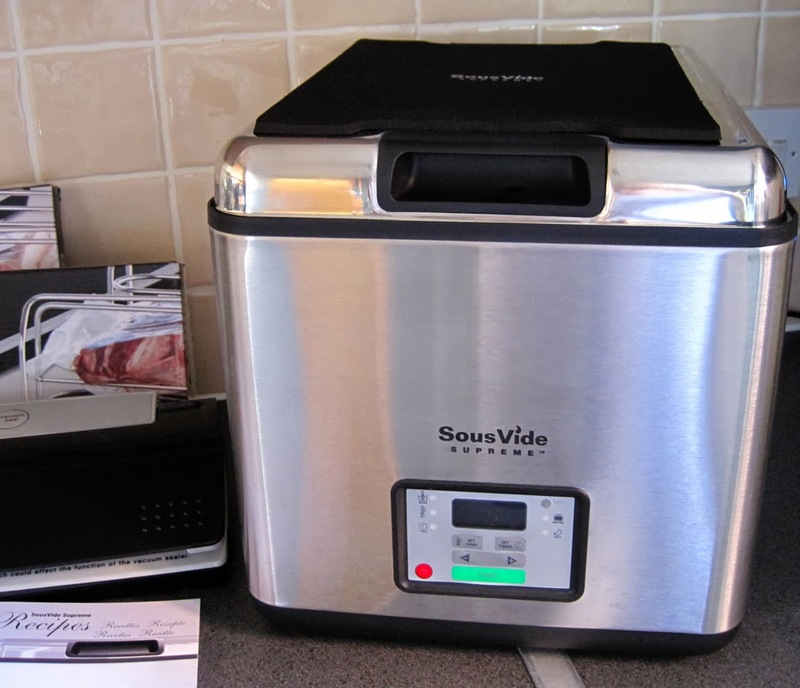 But the good news is, SousVide Supreme have made a smaller version which is perfect for the home cook and big enough to cope with a dinner party. SousVide Vacuum Sealer, which includes 10 pouches of different size, 2 boxes of vacuum seal cooking pouches, and the Easy Sous Vide Cookbook, a DVD and of course there are operating instructions for the water oven and the vacuum sealer. How easy it is to cook with the SousVide Supreme? In return for receiving the SousVide Supreme I have to create a variety of recipes, all using the SousVide Supreme water bath. So over the next few months I will be showing you exactly how easy it is to use. In this post I'll show you three easy to make recipes suitable as starter courses. Whilst this method of cooking is totally different to the norm once you see how amazingly tender and so perfectly cooked a medium-rare steak turns out, I think you too will be converted it makes you look like a professional chef turning out some of the best food ever. So for example if you like your steak medium-rare the precise temperature that a 1 inch thick piece of steak needs to be is to 56.5 C / 134F so once you've set the temperature on the machine as long as the steak has had the minimum time to cook it doesn't matter if you leave it there for another hour, two hours or even most of the day, your steak will stay safe to eat and perfectly medium-rare just as you wanted. All that's needed is an extremely quick flash-fry of 30 seconds in hot butter which will ensure your steak browns and looks as good as it's tastes. Of course it's not all about steak! 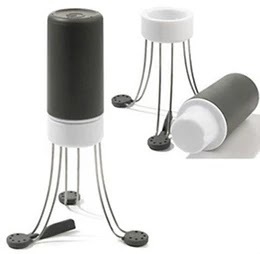 Poultry, Game, all Meats, Fish, Vegetables, Fruit and Eggs can all be cooked perfectly in the SousVide Supreme. Chicken breast for example which is known for very easily becoming tough during cooking, with the SousVide Supreme chicken is perfectly cooked, meltingly tender and so, so juicy. Because when cooking in a vacuum sealed pouch there simply isn't anywhere for the natural juices along with any seasonings you might add to go. Seriously the results are truly outstanding - SousVide also delivers healthier and more nutritious food. Timings and recommended temperatures for your chosen cut of meat, chicken, fish and vegetables and even fruit are all listed in a book as part of the kit. But you can always check them here Sous Vide Cooking Times and Temperatures Reference Guide. Fill to just below the 'Max' as when the food is in the water level will rise, you can either add a little more or remove some if necessary. Seal the food to be cooked in the special food grade pouches which are designed to be sealed by the heat. 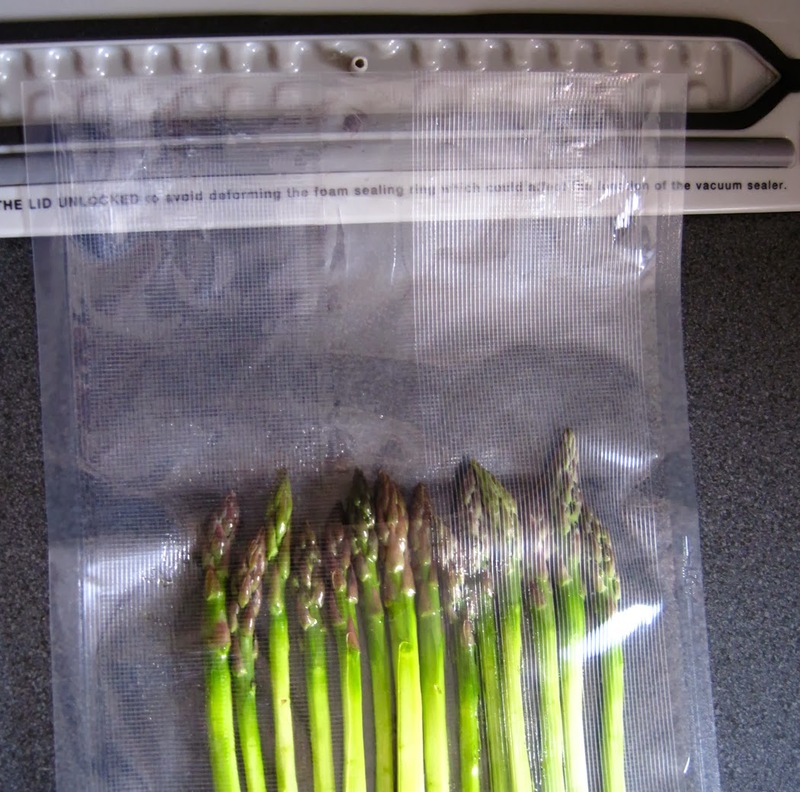 For example, place asparagus evenly in a pouch. Add a drizzle of olive oil, personally I find it best to season after cooking. Make sure the special food grade bag is straight, and with the top of the pouch laying on the rippled surface just touching the air portal. Close the lid and press 'Vacuum/Seal' - the air with be automatically drawn out and the bag will seal afterwards. Your food is now ready to be cooked in the SousVide water oven! 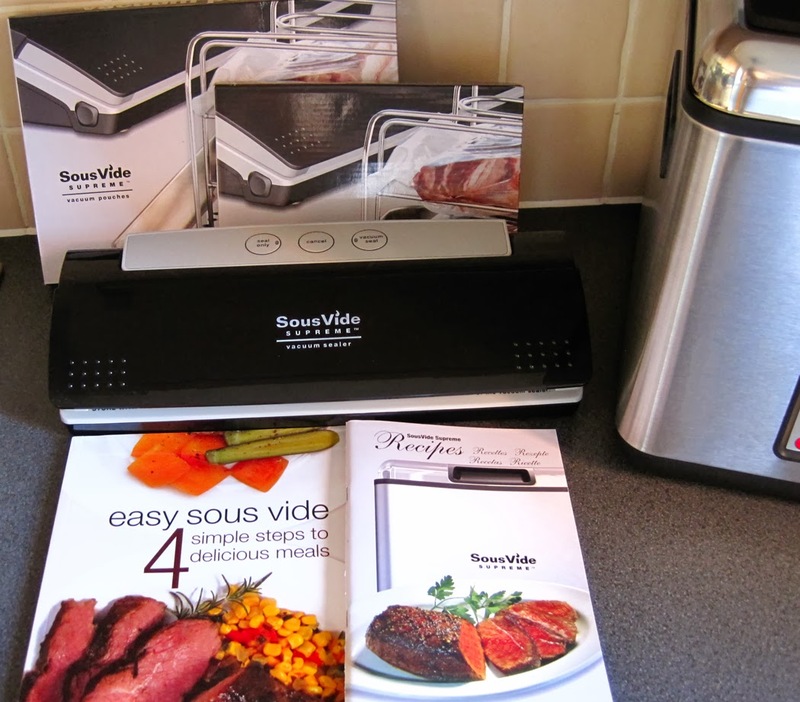 Four Easy Steps to SousVide Cooking are simply; Season, Seal, Simmer and Serve. Season: Meat, chicken or fish or vegetables, fill the machine with hot water and set the temperature on the SousVide water oven. Pop into the special food grade plastic pouches along with any chosen herbs you might fancy. Seal: The pouch using a vacuum machine. Simmer: Once your selected temperature has been reached, place the sealed vacuum pouch into the water bath by resting it in the rack. Put the lid on along with the heat mat included and get on with enjoying your day whilst dinner is being cooked with the temperature being constantly monitored for you by the SousVide water oven. Serve: When the time is up, take the pouch out of the machine and turn the machine off. Open the pouch taking care of the hot steam on opening and you can either enjoy your beautifully cooked food straight away, or continue to cook further depending on your recipe. Leave the water to cool before emptying the machine. 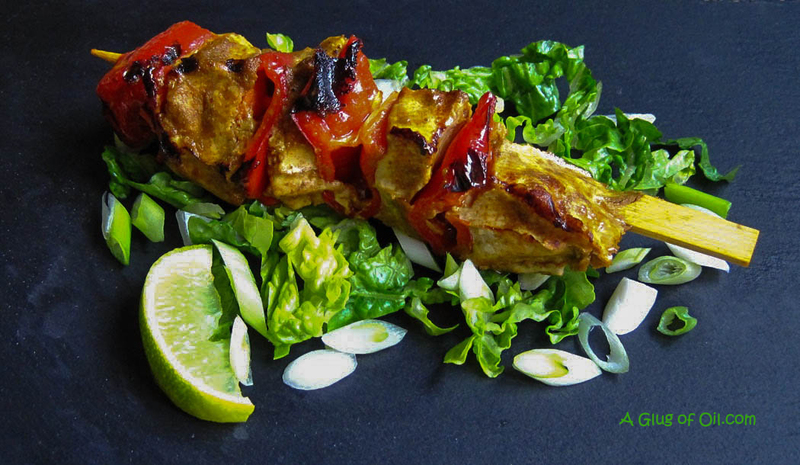 Allow 1 chicken breast fillet and half of a bell pepper for every 2 skewers you want to make. Mix the paste and oil together in a bowl - about 1 tablespoon of paste to a drizzle of oil is enough for 1 chicken fillet. Leave to marinate for at least half an hour. Thread the chicken onto wooden skewers alternating with pepper. Pop the skewers into a pouch - best to roll the top of the pouch so the marinade doesn't get on the top of the bag, if it does it will not seal properly. Once the temperature is reached pop the sealed bags into the bath and allow to cook for a minimum of 1 hour - I left mine simmering away for 2 and a half hours. Remove the pouch from the oven and remember the food will be perfectly cooked through but for presentation just pop the skewers either onto the BBQ for literally 30 seconds each side, or onto a VERY hot grill-pan as I did to achieve a nice char-grilled look. Mix the paste and oil together in a bowl - about 1 tablespoon of paste to a drizzle of oil is enough for 1 chicken fillet. Leave to marinate for at least half an hour. Thread the chicken onto wooden skewers alternating with pepper. 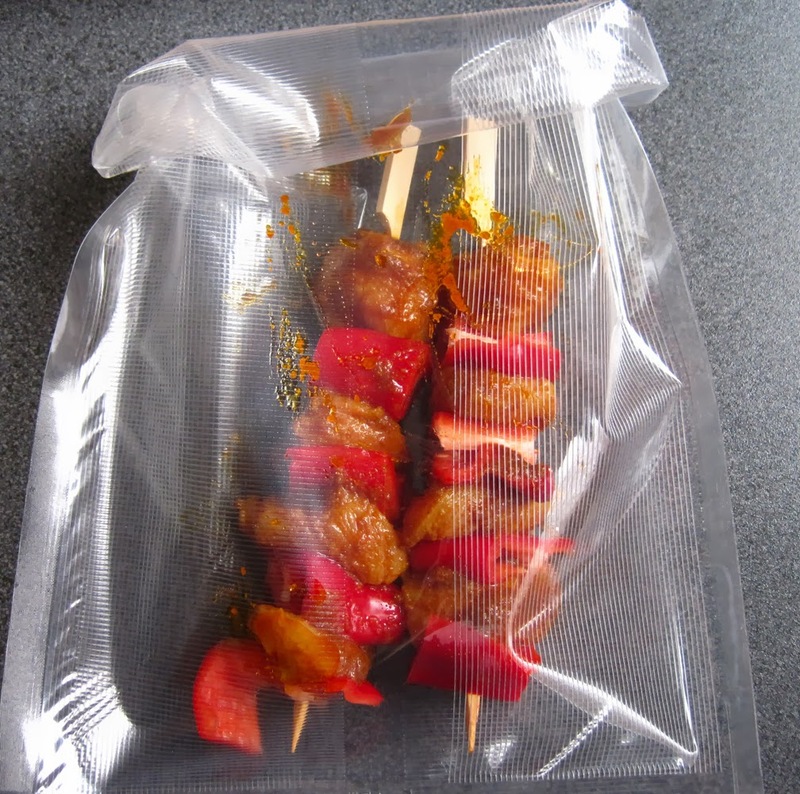 Pop the skewers into a pouch - best to roll the top of the pouch so the marinade doesn't get on the top of the bag, if it does it will not seal properly. Once the temperature is reached pop the sealed bags into the water and allow to cook for a minimum of 1 hour but I left mine simmering away for 2 and a half hours. Remove the pouch from the oven and remember the food will be perfectly cooked through but for visual presentation just pop the skewers either onto the BBQ for literally 30 seconds each side, or onto a VERY hot griddle-pan as I did to achieve a nice chargrilled look. Now enjoy! Allow 1 egg and 4 or 5 asparagus tips per person and 1 rasher of bacon will make enough dust for 6 plates. Fill the machine with hot water and at 88C/190.5 and pop in the vacuum sealed pouch and cook for just 5 to 10 minutes. Remove and without opening the bag, see if it bends easily and when it does it's done. 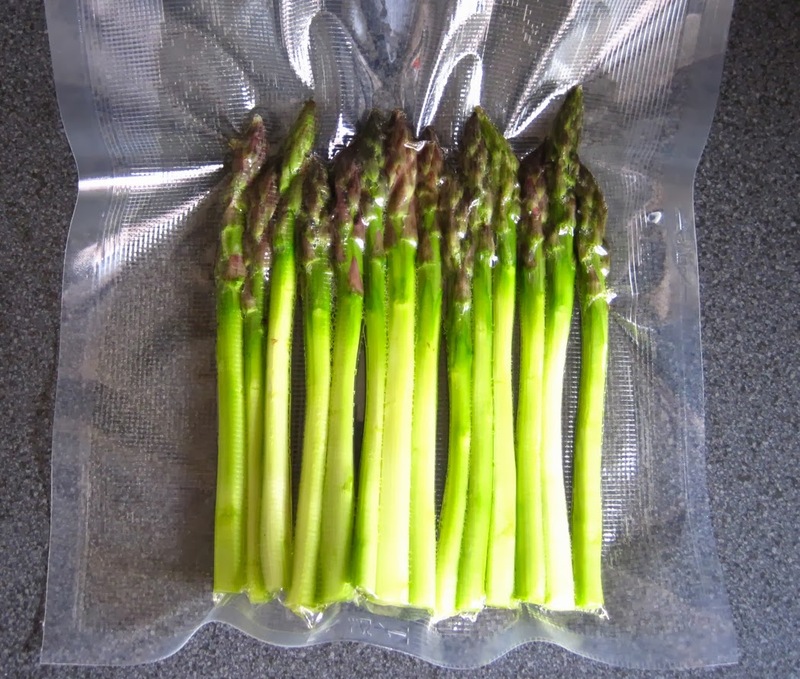 I cooked the asparagus in the Sous Vide water oven the day before, since the eggs and vegetables need different temperatures it was easier. Asparagus needs nothing but a tiny drizzle of oil added to the cooking pouch and I find it nicer if it's seasoned once it's cooked. All vegetables keep their colour and look amazing. Once it was cooked I plunged the bag into ice cold water and left it to cool. Wiped the bag dry and stored still sealed in the bag until the following day. Wipe a non-stick frying pan with a tiny amount of vegetable oil and fry a rasher of smoked back bacon until it's really crisp. Now wrap in a couple of sheets of kitchen paper and pop into the microwave for 30 seconds and it should be very crisp. If not pop it back for another 20 seconds but take care not to burn it. Leave to cool and crush in a pestle and mortar or with under another sheet of kitchen paper with a rolling pin and voi·là bacon dust! After a few experiments I found that a temperature of 65C and 45 minutes produced the perfect soft cooked egg. Very fresh eggs are best for this method of cooking. There is no need to put your eggs in a bag. Fill the Sous Vide with hot water and set the temperature to 65C/149F and once the temperature is carefully lower in your eggs one at a time and set the timer on the machine to 45 minutes. Once the time is up the machine will give out a series of load beeps. Remove the eggs and crack into a cup before placing on your finished dish, only because it's easier that way. Plate your dish up, add the egg and enjoy! Once the temperature has been reached submerge the chicken fillet (prepared as above) into the water and as long as it's been simmering for a minimum of 1 hour. Remember cooking Sous Vide means it can stay there all day if you wish without the chicken drying out, it will stay moist and full of flavour and is ready when you are. Sprinkle the diced cucumber with the salt and leave for 30 minutes. Once ready, pat dry with kitchen paper and put the cucumber into a small bowl. Add the rice vinegar and sugar and give it a good stir. Leave for an hour or so and to serve just drain from the liquid. Once the chicken is cooked, remove and cool in ice cold water whilst still in the pouch. Then remove the pouch and slice the chicken into thin strips. Pop the vermicelli noodles into a bowl and add boiling water, leave for 5 minutes then rinse and drain. Place one spring roll rice wrapper at a time into a large bowl of warm water and leave for just a couple of seconds so the rice paper has softened. Lay on a plate and add the chicken, carrot, lettuce and spring onion filling along with a few noodles, taking care not to overfill. 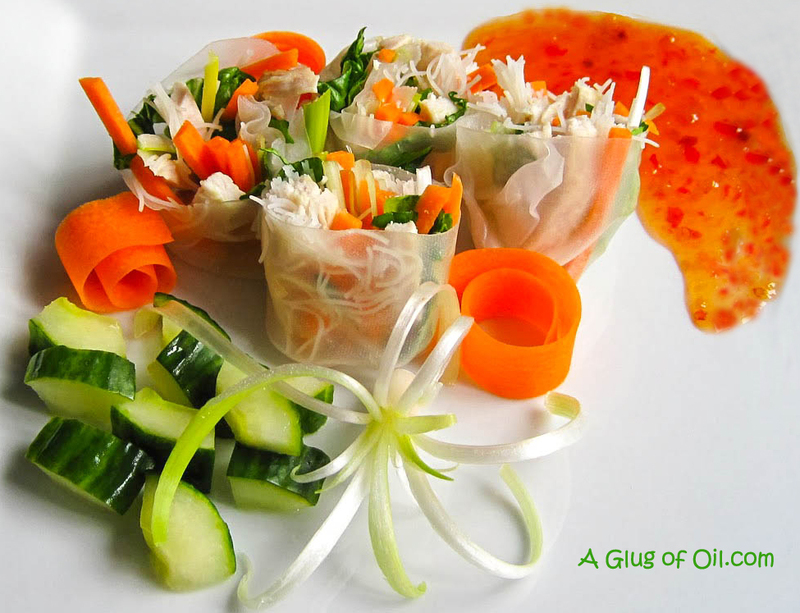 Bring the bottom of the rice paper up to cover the filling, fold the side in and roll. Cut each roll in half when you're ready to serve. Next time I'll be showing you three Main Courses including a selection of vegetables. 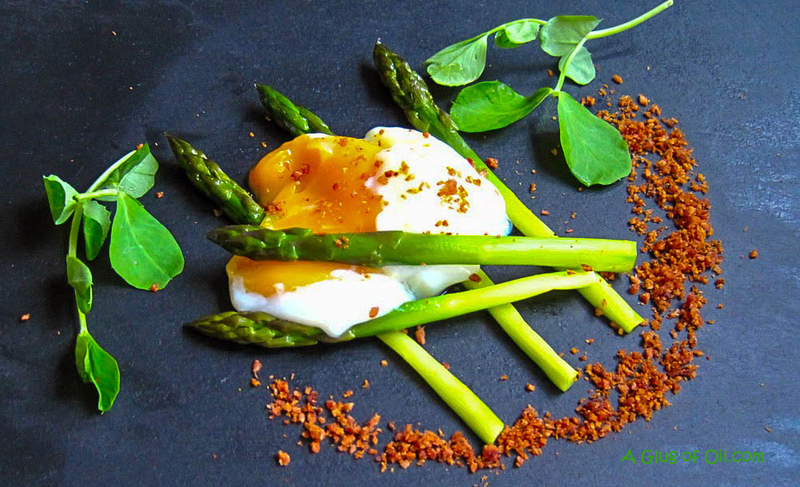 You can find more delicious Sous Vide recipes over at Karen's site; Lavender and Lovage. Thanks for posting Jan. I am here on the advice of Karen as I have just bought a sous vide circulator and am looking for tips to make sure I use the machine to its full potential. Eggs tomorrow. 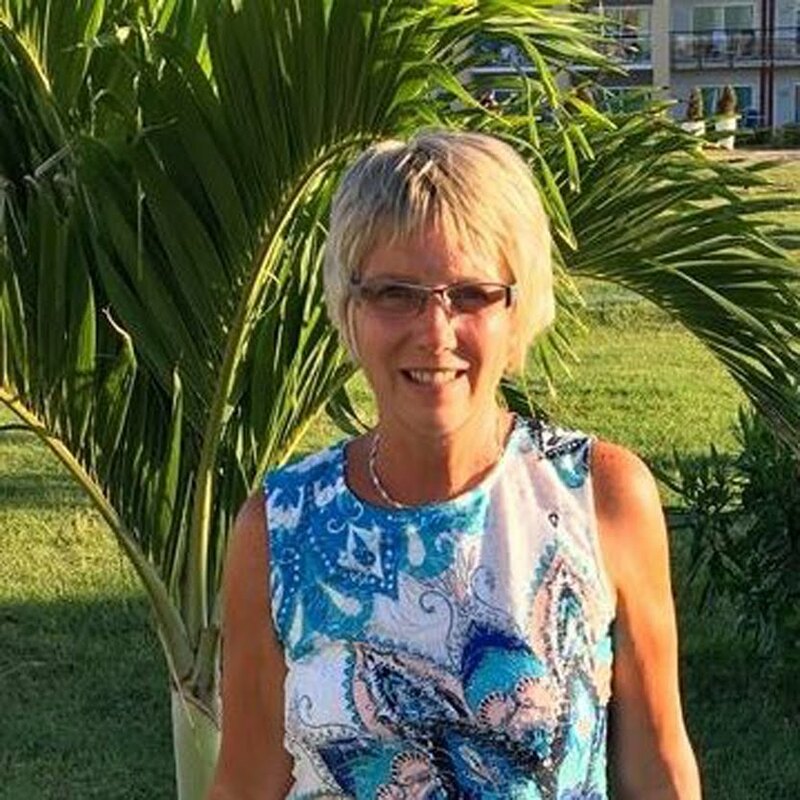 Thanks for posting Jan. I am here on the advice of Karen as I have just bought a sous vide circulator and I'm looking for tips so that I use the machine to its full potential. Eggs tomorrow.